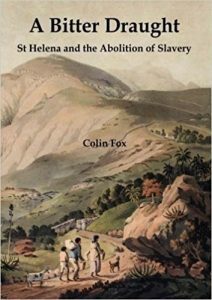 A Bitter Draft, St Helena and the Abolition of Slavery, 1792-1840 by Colin Fox was published on 21st October 2017. Copies are currently on their way to us and should be available in the Museum shop from 21st November. A Bitter Draught tells the story of the abolition of slavery on St Helena, which was ruled for many years by the English East India Company. Slaves had been brought to the island from the time of its first settlement in 1659. In the late 18th century liberal-minded directors of the company wanted to see the end of slavery but were much less inclined to use their wealth to aid its eradication. Instead, it was left to the governors of the island to move matters forward, first by banning the import of slaves, then by freeing the children born of slave mothers and finally, and iniquitously, forcing the slaves to take out loans to purchase their own freedom. Repayment of these loans, hard enough under the Company’s rule, became utterly unfeasible when the island’s sovereignty reverted to the crown in 1834, and the economy crashed. However, this book is more than just a narrative of these events. The author delves deeper into the story of the island’s slaves – where they came from, how they lived, their occupations, their personal relationships, what they wore, ate and drank and even their humour. Small clues, hidden in the minutiae of EIC Factory records, have been collected to provide a glimpse into the lives of these unfortunate people. For many it was a terribly sad story, but there were some who strived with courage, fortitude and hard work to overcome all hardships and achieve freedom for both their families and themselves. These are their stories. A Bitter Draught reveals the chilling history of slavery on St. Helena in the period before the island became a temporary destination for Liberated Africans during the British campaign to end the slave trade in the south Atlantic after 1840. Meticulously researched it is essential reading for those interested in the complexities of the Black Atlantic. I have now had the opportunity to look at your fine book, focusing especially on the early years of the slave story, the period where my own interests lie. The book is thorough, a really good account of a complex, rather sad story, written in an engaging and accessible manner. The history of slavery, and of its abolition, in the South Atlantic world has been greatly enriched by Fox’s masterly account of what happened in the St. Helena case. 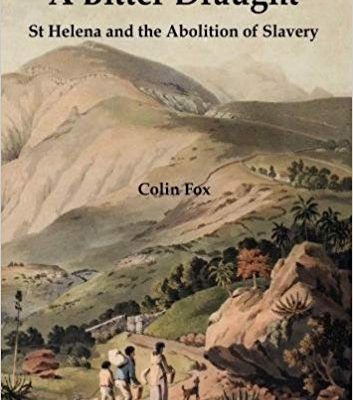 A welcome contribution to the history of St. Helena and our understanding of the East India Company’s involvement with slavery and abolition during the late eighteenth and early nineteenth centuries. Professor Richard B. Allen, Framingham State University, author of European Slave Trading in the Indian Ocean, 1500-1850. This valuable book starts by summarising the earlier history of slavery on St. Helena before examining the era of ameliorative legislation in some detail. Fox has used materials from the National Archives, the British Library and the Bodleian as well as the island’s archive located in Jamestown castle.